This article is about the current system. For the pre-1912 system, see United States circuit court. A court of appeals may also pose questions to the Supreme Court for a ruling in the midst of reviewing a case. This procedure was formerly used somewhat commonly, but now it is quite rare[quantify]. The Second Circuit, sitting en banc, attempted to use this procedure in the case United States v. Penaranda, as a result of the Supreme Court's decision in Blakely v. Washington, but the Supreme Court dismissed the question after resolving the same issue in another case[which? ], which had come before the Court through the standard procedure. The last instance of the Supreme Court accepting a set of questions and answering them was in a case[which?] in 1982. 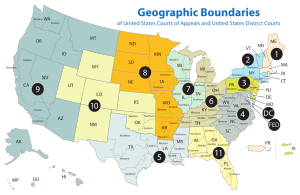 Wikimedia Commons has media related to United States courts of appeals.